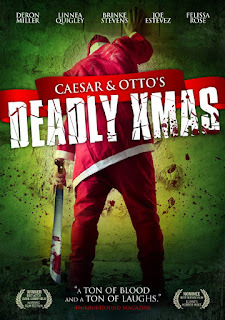 Down on their luck brothers Caesar and his half brother Otto are back with more horror parody mayhem in this fifth entry in the Caesar and Otto saga. In this film the brothers take on some duties over the Christmas holidays as Santa and one of his merry helpers at Xmas Enterprises. They are not the only ones who are going for the job though as another Santa wannabe (CKY'S Deron Miller) is also a keen worker. He soon takes it upon himself to dispatch of Caesar's cancelled Thanksgiving dinner guests. Which naturally the police see the crossed off names on the list and the bodies that coincide leaving Caesar in a rather difficult predicament. With the help of his half brother and father they will find out who is setting them up and clear their names before it is too late. A fine addition to the Christmas horror films with a nice comedy edge in the vein of Abbott and Costello. Not only is the film written well but everything from cinematography to the acting is of great quality. Sure we aren't talking Hollywood stardom coming off the back of this venture but everyone involved is dedicated and it shows throughout. Just some of the people involved in this film are scream queens Linnea Quigley (THE RETURN OF THE LIVING DEAD), Felissa Rose (SLEEPAWAY CAMP), Brinke Stevens (THE SLUMBER PARTY MASSACRE) and Debbie Rochon (SLIME CITY MASSACRE). Outside of the scream queens there is the late Robert Z'Dar (MANIAC COP), Joe Estevez (BEACH BABES FROM BEYOND) and naturally Troma head honcho Lloyd Kaufman makes a brief appearance. This film was followed by CAESAR AND OTTO'S PARANORMAL HALLOWEEN (2015).